Affecting approximately 10 percent of the population, neck pain is rarely associated with life-threatening conditions. In most cases, neck pain subsides within a few weeks, with about 90 percent of people with neck pain reporting no discomfort at all beyond eight weeks. 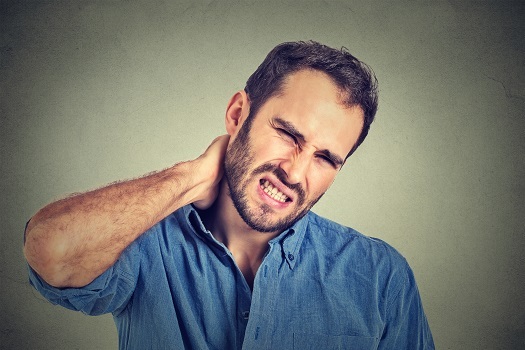 Test your knowledge with these important facts about neck pain. Neck pain is unique in that anybody of any age can experience some degree of neck pain at any given time. However, the average age of neck pain patients is 49, according to physician records. While back pain remains the top medical complaint in the United States, 15 percent of the U.S. population considers neck pain their main pain-related issue. Women tend to report neck pain more frequently than men. In most cases, neck pain is diagnosed with a combination of medical history and a physical examination, although X-rays may sometimes be necessary to confirm degenerative conditions like cervical spondylosis (arthritis of the neck). While any type of contact sport can result in neck pain, among football players, defensive ends tend to be more susceptible to neck pain than their teammates. Wearing a scarf around your neck while sleeping may generate warmth and prevent muscles from contracting. Constricted neck muscles can result in the neck stiffness that’s sometimes felt when first waking up. The pain you feel in your neck is likely related to any of the seven cervical vertebrae that make up the neck or the muscles and tendons supporting those vertebrae. Already available for individuals living with back pain, cervical artificial disc surgery is now a possibility for patients who previously only had fusion surgery as an option when disc function was compromised in the neck. New options include a procedure that replaces a damaged disc with a Mobi-C artificial cervical disc. Beverly Hills patients who might benefit most from this type of surgery include those with diseased or bulging cervical discs. The seven bones of the cervical spine (neck) and the muscles that support it can be a source of discomfort that’s temporary and mild or persistent and severe. Most people experience the former rather than the latter. Even so, knowing what often causes neck pain may help you prevent unexpected aches and pains. Here are some of the top causes of neck pain. Often resulting in a “crick” in the neck felt soon after waking up, neck pain related to sleeping positions is caused by added pressure on joints and muscles. Avoid stomach sleeping to maintain back-neck alignment, and also try to avoid excessive tossing and turning as much as possible. Also, opt for a comfortable, supportive mattress. Anything that keeps your head tilted or turned abnormally for sustained periods can be a possible cause of neck pain. An increasingly common phenomenon is called “tech neck,” caused by a tendency to glance down at various devices. Counter your posture issues by keeping things at eye level and taking breaks to do basic neck stretches like side-to-side head motions. Being new to the game or sustaining a hard fall or hit are among the most common causes of sports-related neck injuries. Neck and shoulder pain caused by a sports injury is often the result of nerve pressure, also referred to as a “stinger” due to the resulting weakness, tingling, and numbness. Pain may be felt in the shoulders or radiate to arms and hands. Often associated with car accidents, whiplash simply refers to any sudden twist, jolt, or turn that causes neck pain. It’s important to pay attention to symptoms that may develop later because pain isn’t always immediately experienced with soft tissue injuries. Repeating the same motions can place strain on neck muscles, which is a common cause of neck pain for competitive swimmers, although it can also be work-related if you’re constantly turning to look at a computer screen positioned off to the side as you type. Overuse and overextension often contribute to most instances of neck pain. If this is the case, a little rest and care involving the application of heat or ice and over-the-counter painkillers may help. For neck pain that stays around or gets worse rather than better, talk to your doctor or a Beverly Hills spine surgeon. If you’re having severe or persistent pain in your neck, don’t hesitate to consult a spinal health specialist. The industry-revolutionizing experts at The Spine Institute have decades of experience with all sources of neck and back pain, and we employ the most innovative methods of diagnosis and treatment to alleviate pain and promote long-term spinal health. Call one of our friendly representatives today at 310-828-7757 to schedule a consultation.